Roasted Beets are a great for making salads and packed with nutrients! I love how the dressing soaks into the beets to make each bite packed with flavor! Happy Spring!! Crazy, right? Feels like it was just Christmas! Until recently, I have not given beets the chance they deserve. They’ve always been one of those intimidating veggies that I always wonder what to make with it! 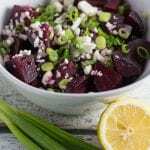 Well for this months Recipe Redux post I am sharing this 7 Ingredient Roasted Beets with Feta Salad! PIN this 7 Ingredient Roasted Beets with Feta Salad recipe for later! Preheat oven to 425 degrees F. Rinse beets and cut off the beet greens just about 1 inch from the stem. Discard or save to cook them later! I typically discard them. Pro tip: choose smaller beets so they take less time to roast in oven! Line an oven safe baking dish (or a baking sheets works too) with foil and place beet in the dish. Drizzle them with olive oil and then place more aluminum foil on top – pressing aluminum foil loosely down and around each beet! Place beets in the oven on the middle rack. Depending on size, the beets will roast for about 1 hour to an hour and a half. Pierce the beet with a fork to check if they are done after 60 minutes. Let beets rest until they are cool enough to handle, and then peel the skin off. (Time to get those hands dirty and PINK!) It’s more of a pressing motion rather than peeling. If you can’t seem to get the skin off, this means the beets need more time in the oven to roast! You can use gloves or paper towels to help assist. Lastly cut the beets into the size chunks you’d like for the roasted beets salad! Are roasted beets keto friendly? How long do roasted beets last? Properly stored in an air tight container: 3-5 days! What other flavors go great with roasted beets? Do I have to roast the beets? No – You can use Love Beets for to skip the roasting process. You can find baby beets or cooked beets in most local grocery stores. What are some other recipes I can make with beets? Beet Pesto Pasta is one of my favorite pasta recipes – I mean, cmon – just look at that color! You’ll be sure to blow away any guests/family/friend you make this for! Running out the door and need something nutritious? Blend up this Wild Blueberry Beet Smoothie – 8 ingredients only and you probably have most of them already on hand! Flavorful Spring Salad! 7-Ingredient Roasted Beet and Feta Salad is one for the books! Preheat oven to 425 degrees F. Wash beets well and place in a oven safe dish and cover with foil. Roast beets in oven for 1-2 hours, depending on size. (Step by step directions above!) You should be able to stick a fork or toothpick in easily. Let sit for 30 minutes before you remove the skin. Be sure to use a paper towel or gloves to peel off the skin! Chop the beets and let marinate in 2 Tbsp. of the EVOO and balsamic vinegar for 10 minutes. Then toss in remaining ingredients and stir. Serve cold. Enjoy! Beets are like sponges - they soak everything up! This is why I let the beets marinate for a few minutes in the olive oil to get extra tasty! You may also use parsley instead of green onions as a substitute! Also - if you don't have time to roast the beets, you can buy baby beets or cooked beets (I like the brand Love Beets). How do you like cooking with beets? I’d love to hear! Comment below to let me know! Beautiful photos! I adore beets, so this one is definitely getting added to the line-up for Spring. What a beautiful salad! It looks gorgeous and full of favour. Thank you! 🙂 It’s packed with flavor! 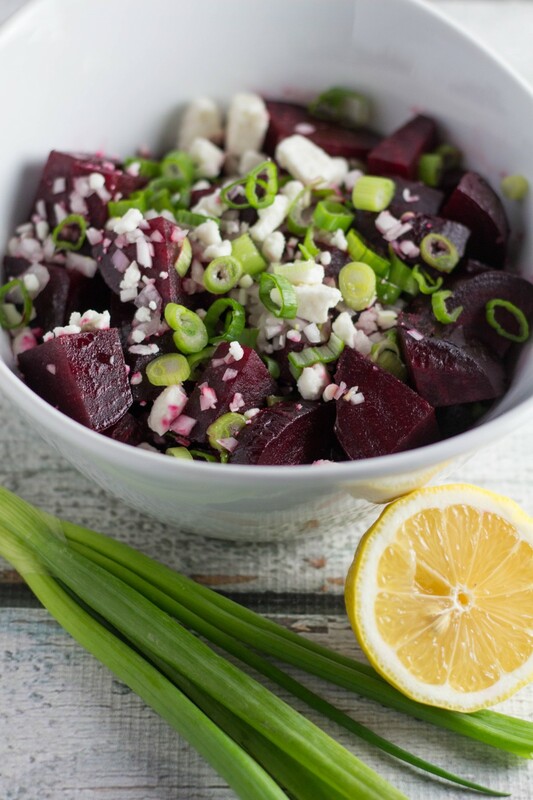 Beets and goat cheese is one of my favorite flavor combos, but love them with feta too. Such a pretty salad! I love how sweet beets get when roasted! Feta sounds great in here! I’m confused, what do you do with the lemon? Are you using only the juice? Yes I used only the juice, may use some zest if you like as well! Sounds delicious! I plan on trying the recipe tonight. I just made this tonight for dinner and my husband and I really liked it. The beets were so soft and sweet after roasting them for 2 hours. We tried peeling the skins off with a paper towel but that didn’t work so we just used a potato peeler. Next time I will use less balsamic vinegar since I’m not a big fan of the taste but other than that, it was good! Ok, this salad. I can’t wait to make it! It looks so freaking good, pinning for later!